The heavier the bag, the less it sway the bag will have. Some sway is an asset as the movement of the bag will allow you to train your foot work. With too light a bag, on hard impact the bag will swing back and forth, not allowing you to work on your timing, foot work and creating a potentially hazardous condition. A 5'7", 165lb. male who punches fairly hard should select a 60 or 70lb. bag. Extremely heavy hitters should select a 100lb. bag and those who hit lighter or are using the bag primarily for cardiovascular training should select a 40lb. bag. If you would like to train your accuracy and precision, the smaller target area of a 25lb. or 40lb. bag will help your focus and control. The larger area of 70 - 100lb. bags may be preferable if you are kicking and do not yet have the accuracy. To minimize the sway on a lighter bag, select a double-end bag. Double-end bags tether to the floor with a flexible cord, minimizing sway. 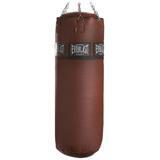 If you do not have the ability to mount the heavy bag, see the heavy bag stands.